The White House has announced that national security adviser Michael Flynn has resigned amid reports he misled top officials from President Donald Trump's team about his contacts with Russia's ambassador to the United States. Flynn's departure late February 13, less than one month into President Donald Trump's term, marks an unusually early shakeup for a president's senior team of advisers. Flynn was a loyal Trump supporter throughout Trump's improbable campaign last year, but his ties to Russia caused concern among other senior Trump advisers. In what may have been an irreversible mistake, Flynn initially told Vice President Mike Pence that he did not discuss sanctions with Russian Ambassador Sergei Kislyak during multiple phone conversations they had in December when former President Barack Obama was preparing a new round of sanctions against Russia for allegedly hacking the presidential election. Flynn's assurances led Pence to vouch for the former general in a television interview. But weeks later, Flynn conceded in response to published reports that he may have discussed sanctions with Kislyak. Any such discussions may have violated U.S. law prohibiting private citizens from conducting foreign policy. In a resignation letter issued late on February 13, Flynn said he gave Pence and others "incomplete information" about the phone calls. The White House named retired General Keith Kellogg to replace Flynn as acting security adviser. He is also among three people the White House said Trump is considering naming to the post permanently. The other two are former CIA Director David Petraeus and Vice Admiral Robert Harward. The resignation came amid allegations that the White House may have known more than officials have publicly acknowledged about the phone conversations. 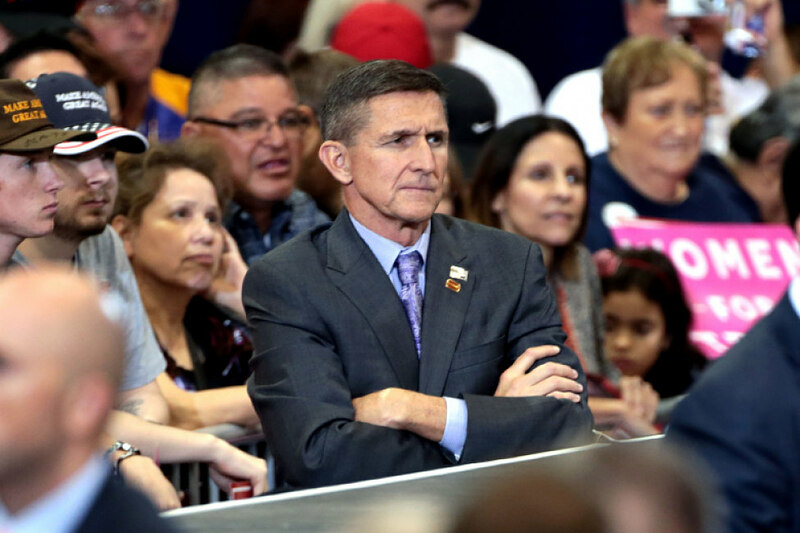 The Associated Press (AP) and Reuters news agencies both reported late on February 13 that the U.S. Justice Department had warned the White House that Flynn could be in a compromised position as a result of the contradictions between the public depictions of the calls and what intelligence officials knew to be true based on recordings of the conversations, which were picked up as part of the routine monitoring of foreign officials' communications in the United States. The Washington Post reported last week that Flynn discussed sanctions with the Russian envoy. AP reported that Flynn was in frequent contact with Kislyak on December 29, the same day the Obama White House imposed a new round of sanctions on Russia over its allegedly meddling in the U.S. presidential election and harassment of U.S. diplomats. Several Democrats in the U.S. House of Representatives have called on the House Oversight Committee chairman to launch an investigation into Flynn's ties to Russia. Senate Democratic leader Charles Schumer told reporters he wants an independent investigation of Flynn's discussions with Kislyak. Representative Eliot Engel, the ranking member of the House Committee on Foreign Affairs, said after Flynn announced his resignation that he was "doing the right thing by stepping down." "However, far too many questions remain unanswered about this administration's ties to Russia," he added. Besides being illegal to conduct U.S. diplomacy before taking office, Flynn's repeated conversations with Moscow's ambassador have also renewed questions about Trump's friendly posture toward Russia at a time when U.S. intelligence agencies have concluded that Moscow hacked and released Democratic Party e-mails with an eye toward helping Trump get elected.